For the sixth installment of our Berlin Experiment series, Dimitri Hegemann—founder of the iconic Tresor club and label—remembers the notorious FischBüro (Fish Office), a hangout for West Berlin eccentrics and intelligentsia and the location of one of Berlin’s first techno clubs, UFO. The FischBüro’s Dadaist cultural experiments followed a rhizomatic cultural logic upon which Berlin’s nineties boom was based. According to Hegemann, every city should have a FischBüro. It was freezing cold out. Frost flowers were growing on the windows. It was the arctic winter of 1985/86. I was living at Lübbener Straße 20 (courtyard, fifth floor) in Kreuzberg. It was still dark in the mornings when I set off for the Free University, where I studied musicology. It was a long way from Schlesisches Tor to the campus in Dahlem, and at the time it took almost as long as it now takes to get from Berlin to Hamburg by the Intercity-Express train. Every morning on my way to the subway, chilled to the bone, I passed a store at Wrangelstraße 95, where lights were shining behind fogged windows. It seemed so warm and cozy. So one day I just went in. A girl was sitting there with a giant machine. “Hi. I always walk by here. What do you do?” I asked. “I make shoes. My own label. But it’s not going so well. I’ll probably quit.” Soon I went to the store every day. It finally became clear that she really was quitting to take a job in West Germany. So she asked me if I would be interested in taking over the store. She still had six month left on her lease, for 100 deutschmark a month. I said: “Great!” By next Tuesday she was gone and I moved in with David Boysen and Rick Garcia. Except for the huge shoe repair machine, the Power Master Finisher, the store was completely empty. We were wondering what to do with it. “We need a lectern”, I said, because I always gave lectures to David and he to me. So we built a lectern and wrote “FischBüro” (Fish Office): “Fish” for movement and “office” for structure. Soon some people came in and started asking, “What’s going on here?” And just like that, a group was forming. I have no idea where they all came from. Every Saturday night, 30 to 80 people congregated. We held so-called “advanced training classes” that were finished by 11 or 12 p.m. Three times we also had a breakfast because some of our guest speakers couldn’t come at night. They were Timothy Leary, Robert Anton Wilson and Timothy Leary again. He could only do mornings. The FischBüro’s declared objective was to turn consumers into producers, to encourage people to start something, give a speech, anything. I emceed the events, moving through the room and asking people: “What will you be talking about today? Come on, anything. How about you read from the phone book?” Käthe B. used to do that. I presented him with: “Today Käthe’s got a surprise for us.” He came onstage, said “Good evening”, got out his notebook and read us three phone numbers: “The first one is from Northern Germany.” People went nuts. As soon as he read the Hamburg area code 040, the audience started cheering loudly. He finally revealed the whole number and followed up with a little legend about it. Then came the hit: an ex-girlfriend’s friend’s number in Amsterdam. It started with 0031. The room went wild. Back then, we got excited about little things, and everybody got their three minutes of fame. The FischBüro became a place where the eccentric West Berlin intelligentsia gathered. About once a month, we came together for an om session with the Power Finisher. The machine was a maybe 25 foot long steel monster with an assortment of rotating brushes. I’m not sure what exactly it was supposed to do – grind, polish, all sorts of things, I guess, a kind of electric shoe polisher. The thing stayed with me a number of years. It became instrumental for us in reaching nirvana, as we were experimenting in all areas. There were maybe 30 or 40 people, we turned off the light and set the Power Finisher to 1. It sounded like a UFO. And then we all flew away. Every Monday, the weekly crisis meeting took place: “Is there still hope for the FischBüro?” We also had our own fanzine, InterFisch, a print magazine with headlines like “Last Rites for FischBüro” or “FischBüro Lapsing into Pointlessness,” and so on. We also ran a very successful matchmaking agency. We drew up proper contracts for the purpose of establishing interpersonal relationships. Then lawsuits were filed against the FishBüro, because we were so successful that a couple of people procreated and demanded support for their offspring. We were able to avert that. 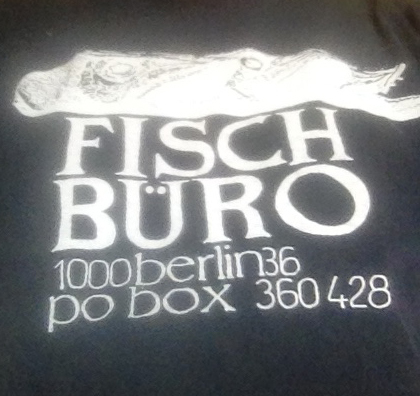 The FischBüro’s patron was a Mrs. Fisch. Everything was registered to Mrs. Fisch—the lease, the phone, everything. When the mailman came looking for Frau Fisch with a yellow letter from the court, he could never get a hold of her. One of the Fisch Agents built a device for routing phone calls to speakers so we could all listen. So one night we did an experiment and called people with the last name Fisch. “This is Mrs. Fisch.” “Yes, hello, you are on air live at the FischBüro in Berlin! We would like to talk to you.” “One moment, I’ll get my husband.” We called about ten Fisch people. I had just got a multi-band world receiver radio and pulled a telex machine out of the trash. We collected everything that was lying around and seemed interesting. That’s what you did back then. Some freak connected the radio to the telex and tuned it to the Prawda’s frequency in Moscow. All the time, highly sensitive information destined for the Prawda’s offices came to the FischBüro simultaneously. The machine was rattling day and night, information from all over the world, of which of course the Prawda published only a fraction. The FischBüro publicly posted everything. Then someone broke in and burgled us. He came several times and stole my ID, too. I posted a note for him, asking him to bring back certain things and offering him to pick something else instead—which he did. My ID came back. Other things vanished. We did experiments on a regular basis. The Smeggle Test, which stands for super mantle gridlock, was supposed to determine the correlation between a New York City rush hour traffic jam and the FischBüro-goers’ state of mind. The test subjects were asked to draw a five-pointed star but could see their drawing only through a mirror. The results were shattering. 99% of the participants had to abandon the attempt. They managed the first line but at the first bend didn’t know how to proceed. It was very strange. There were a few who could do it just like that. But Timothy Leary wasn’t one of them. He did write in the guest book though. We also had another very nice test: Seven seconds for eternity. Frau Fisch wanted to create a historical film document in which the subjects had seven seconds to record a message to visitors of planet earth in the year 3000. The setup was a puppet theater with a clock: seven seconds. Participants were supposed to do a short introduction and then record their message. We made three copies, one for the FischBüro, one for Obersalzberg, and one was sent to outer space via Balkonur. Most subjects failed the test and only stammered something, advertised their apartment hunt or asked how much time was left. Then Robert Anton Wilson came and said: “Doubt everything, question authorities, think for yourself and find your own light.” In 3,5 seconds. In the end we compiled it all to a video clip for Space Beer, our newest invention. All of the craziest statements in a row, and the credits said: “Powered by Space Beer”. It was a beer brewed with cosmic substances. If you managed to drink about 30 bottles, you got stuck under the ceiling and the cleaning lady had to scrape you off the next morning. Timothy Leary loved that beer. That was in 1989 and already at the second FischBüro in Köpenicker Straße 6, another storefront apartment Frau Fisch had rented in 1988. We discovered a basement under the store that could be accessed through a secret trapdoor in the floor. We didn’t ask twice but just opened a club down there called the UFO. You had to come through the FischBüro to get in. A stranger wouldn’t know where it was. That gave us a chance to screen them, and if they were alright, we’d open the hatch and send them down the chicken ladder. That club was the hangout for the people who were at the first Love Parade and came back there to drink coffee after the rain. I didn’t go to the parade myself because I was getting the UFO ready. We did send a Space Beer truck though. Afterwards they all came to us to party on. After six or seven months we had to close the UFO. The neighbor couldn’t bear it any longer. It was too unusual, too strange, too new, too loud. This was where we first listened to the sound of Chicago: Marshall Jefferson’s “Open your Eyes”. And that´s what I did.